We are one of America’s best large employers. Telling our employees’ stories is something that we and our sister company, Cushman & Wakefield, take very seriously. It’s an effective way to build morale, highlight our value, and draw attention to the great work that our teams are doing every day. 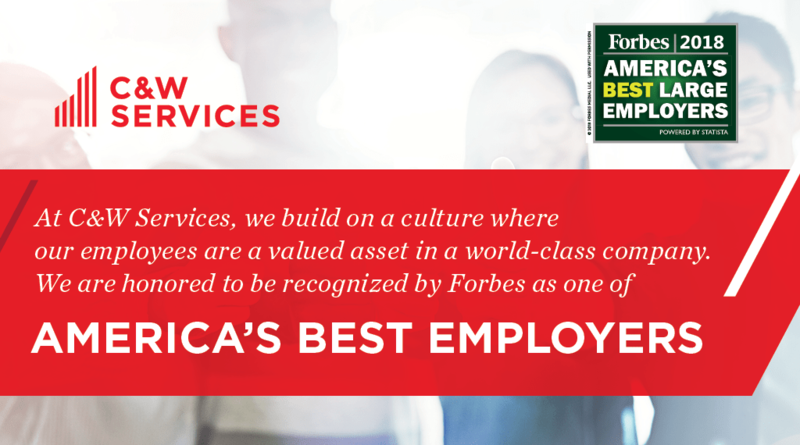 Recently, Forbes surveyed some of those employees, and we’re pleased to announce that Cushman & Wakefield has been named one of America’s Best Employers of 2018. We couldn’t have done it without all of our amazing team members! Each year, Forbes decides on America’s Best Large Employers by surveying a large number of American employees working for companies with at least 1,000 people. The people surveyed are chosen at random and encompass a wide range of ages, ethnicities, levels of employment, and types of contract. The winners of the award are determined by two criteria. First, participants in the survey are asked to rate their willingness to recommend their employer to their family and friends. Second, participants are prompted to evaluate other employers in their respective industries. We are truly honored to receive this award because it’s based on our employees’ feelings about the company. Our employees are the backbone of our service delivery success, and the reason why we are able to raise the value of facilities services. We are committed to developing, empowering, and investing in our people through our apprenticeship program and veterans initiative. You can learn more about why C&W Services is a great place to work by reading some of our employee stories.